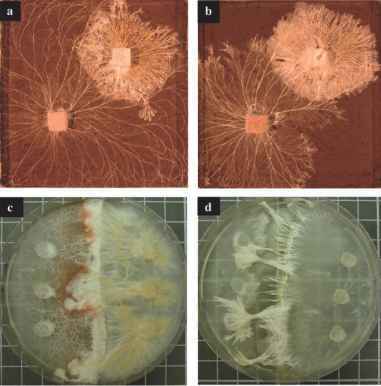 Most studies on effects of basidiomycetes on leaf decomposition have been from temperate zones, specifically in relation to the inhibitory effects of exogenous nitrogen inputs on rates of decomposition of high lignin resources (Magill and Aber, 1988; Berg and Matzner, 1997; Carreiro et al., 2000; Hobbie and Vitousek, 2000) or on enzymes involved in delignification (Fenn and Kirk, 1981; Kirk and Farrell, 1987; Carreiro et al., 2000; Waldrop et al., 2004; Chapter 2 and 10). Several temperate zone studies examined effects of fungal enzyme systems on rates of leaf decomposition (Cromack and Caldwell, 1992; Osono and Takeda, 2002; Chapter 10), but there have been few studies on tropical basidiomycete (Urairuj et al., 2003; Chapter 2). Santana et al. (2005) found that basidiomycetes significantly increased rates of decomposition in low-quality leaf litter by 22% beyond that caused by microfungi alone in a microcosm experiment in Puerto Rico. Similarly, white-rot basidiomycetes significantly increased the rate of mass loss during a field experiment in a secondary wet subtropical forest at Sabana in the Luquillo Mountains of Puerto Rico (D.J. Lodge et al., unpublished). A natural mixture of freshly fallen leaves (10 g fresh mass = 4.0 g oven dry mass) was allowed to decompose for 3 months beginning in mid-June 2004 (rainy season). In paired comparisons, after 3 months, decay of litter placed on white-rot litter basidiomycete mats was 8.4% greater than on adjacent (<50 cm away) forest floor lacking mats (12 pairs; Figure 1). Figure 1 Percent white-rot and mass loss in freshly fallen leaves that were decomposed in wet subtropical forest in Puerto Rico for 3 months situated on or off (< 50 cm away) litter mats formed by white-rot basidiomycetes. Percent of leaf area with white-rot was estimated visually twice using calibrated leaf models. (a) Percent of leaf area affected by white-rot on and off of basidiomycete litter mats. (b) Percent mass loss on and off of basidiomycete litter mats. The difference in rate of mass loss between treatments was significant (paired t-test, P = 0.0028). resources where nutrients are in short supply (Hintikka, 1970; Lodge, 1993; Carreiro et al., 2000; Chapters 1, 3 and 10). Nutrient translocation by bas-idiomycetes may be largely responsible for early increases in nutrient content beyond 100% of the initial content in some tropical studies (Lodge, 1993; Lodge et al., 1994). In temperate leaf litter nitrogen is generally in short supply, whereas phosphorus is more limiting in low elevation tropical forests, and both N and P may be cycled tightly in tropical montane forests (Vitousek, 1984). At least part of the increased rate of decomposition we observed when litter was placed on basidiomycete mats could be attributed to the greater ligninolytic capacities of basidiomycetes compared to microfungi (Cromack and Caldwell, 1992; Chapter 2). Santana et al. (2005) found a similar increase in leaf mass loss beyond that caused by microfungi alone in microcosms that contained ligninoly-tic basidiomycetes. Similarly, fungi with ligninolytic capabilities caused the greatest mass loss in a comparison of litter fungi from a temperate deciduous forest in Japan (Osono and Takeda, 2002), and in a comparison of tropical endophytic fungi (Urairuj et al., 2003). Most microfungi present in litter are anamorphic states of ascomycetes that lack ligninolytic enzymes, but species of Xylariaceae do have the ability to decompose lignocellulose (Osono and Takeda, 2002; Urairuj et al., 2003).